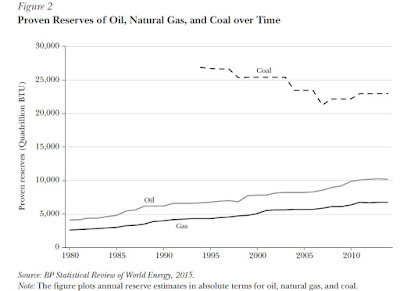 CONVERSABLE ECONOMIST: Will Peak Oil or Renewables Make Climate Change Moot? Will Peak Oil or Renewables Make Climate Change Moot? Hopeful onlookers sometimes point to two possible escape hatches from the problems of burning fossil fuels. One escape hatch is "peak oil"--that is, the argument that production of fossil fuel resources is near or its peak. In this view, the impending fall in fossil fuel production might well bring higher prices and other economic hardship, but at least emissions from burning fossil fuels would drop. The other escape hatch is a large rise in cost-competitive non-carbon sources of energy, like solar and wind, but also nuclear and hydroelectric power. If these sources of energy undercut fossil fuels on price, then the economy could make a transition away from fossil fuels to an economy that used on cheaper and abundant energy from these other sources. But there's yet another possibility, and it's the one laid out by Thomas Covert, Michael Greenstone, and Christopher R. Knittel in their article, "Will We Ever Stop Using Fossil Fuels?" appearing in the Winter 2016 issue of the Journal of Economic Perspectives. In this outcome, supply of fossil fuels isn't going to run out in the next few decades, and alternative non-carbon energy sources aren't going to become cost-effective for enough uses in that timeframe to substantially reduce consumption of fossil fuels, either. One might wish it was otherwise. As the authors write: "After all, who wouldn’t prefer to consume energy on our current path and gradually switch to cleaner technologies as they become less expensive than fossil fuels? But the desirability of this outcome doesn’t assure that it will actually occur—or even that it will be possible." Because they believe that neither of the two escape hatches from the problems of burning fossil fuels are likely to be available, they argue that addressing issues like climate change and conventional air pollutants will require a strong policy intervention to reduce the use of fossil fuels. equal to that year’s consumption." 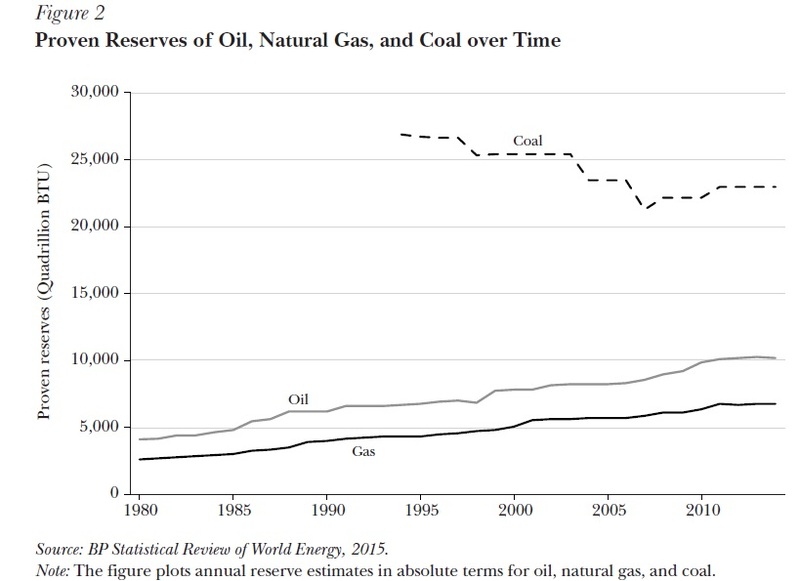 Here's a figure showing the growth proven reserves of oil and gas reserves over time. and perhaps even centuries to come." Our conclusion is that in the absence of substantial greenhouse gas policies, the US and the global economy are unlikely to stop relying on fossil fuels as the primary source of energy. The physical supply of fossil fuels is highly unlikely to run out, especially if future technological change makes major new sources like oil shale and methane hydrates commercially viable. Alternative sources of clean energy like solar and wind power, which can be used both to generate electricity and to fuel electric vehicles, have seen substantial progress in reducing costs, but at least in the short- and middle-term, they are unlikely to play a major role in base-load electrical capacity or in replacing petroleum-fueled internal combustion engines. Thus, the current, business-as-usual combination of markets and policies doesn’t seem likely to diminish greenhouse gases on their own.